DISCLOSURE: Some of the links in this post contain affiliate links. Know that I only promote products I or my guest posters personally use and stand behind. To learn more about my affiliates, please review my disclosure policy here. 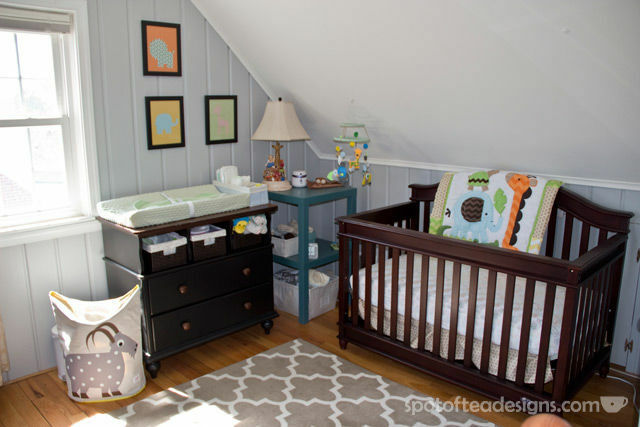 I’m SO excited to share this adorable nursery lovingly created by my bestie and her hubby, SOTD contributors Allie & Tim. 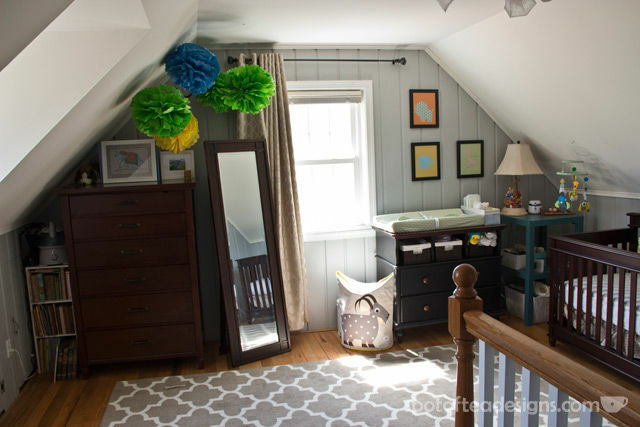 As always, Allie not only put her awesome home decorating skills of mixing and matching patterns and colors to good use, but also added plenty of fun DIY touches – like my personal favorite, a handmade mobile! Take it away, Allie! The first was based on my husband and his family’s love of sports. I envision years of baseball, soccer, football and golf in our house and on the clothes our little one will be wearing, so why start now? No sports, please. Second, I wanted something gender neutral so we could have a greater possibility of using it again. Third, I wanted to include my love of travel and animals. I spent way too long browsing online and eventually settled for the Circo Jungle Stack Collection as my inspiration for the room. It has fun animals, bright colors, graphic patterns and even an owl to tie back to my bridal shower! Most of the furniture we already had or was gifted, except of course the crib. 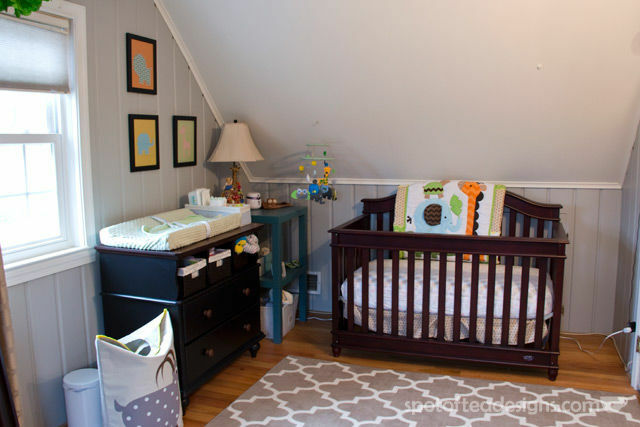 Since we had a slanted ceiling in our nursery, I was happy we found a crib that finally fit! I, of course, spent lots of time on Pinterest. After finding a pin leading to this silhouette picture of a giraffe, I was off to Google silhouette images of animals. 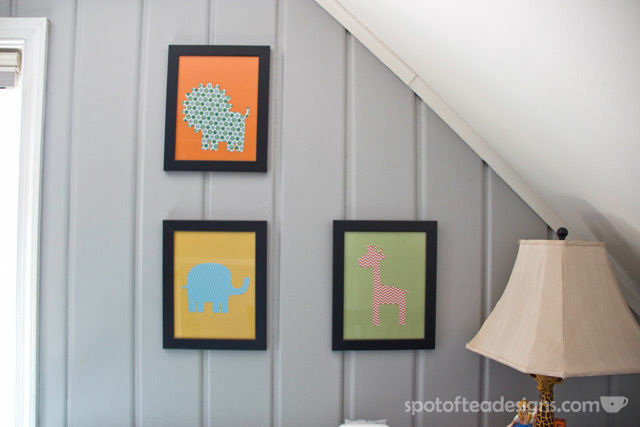 I found images of an elephant, giraffe and lion which I printed out and used as a template. I chose paper with graphic prints that matched the nursery colors and added them to the embossed polka dot papers. 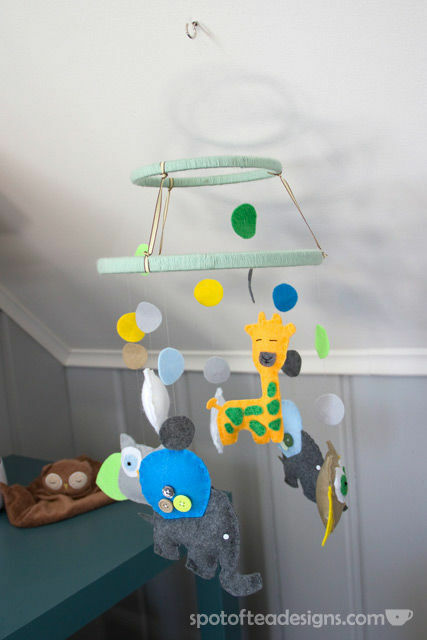 These colorful handmade creations hang above the changing table. I had considered buying a mobile, but after seeing a really cute felt mobile sold on an Etsy shop for $180 I instantly thought, “I can make that!” So off I went to DIY a felt mobile. Maybe this wasn’t needed, but I love pom-poms! Their colors and texture make such an impact, and after having them at my bridal shower and using them for Tara’s bridal shower I really wanted to incorporate them in the nursery. They now hang in the other corner of the room, as seen above. 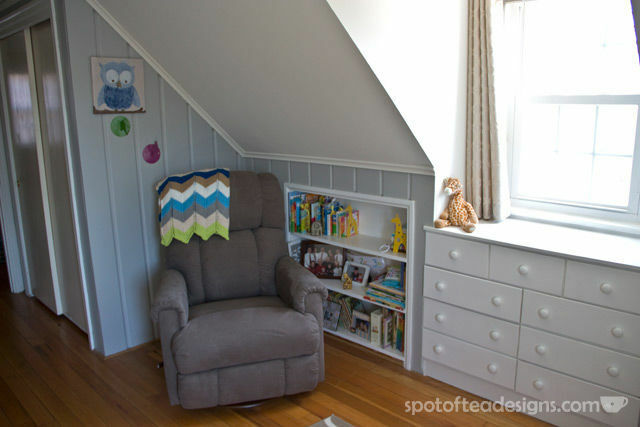 We splurged and purchased the Pinnacle Reclina-Glider Swivel Recliner for the nursery. I wanted to recline if I had to spend the night in the chair with the baby. The gliding motion is supposed to be more ‘natural’ than rocking (plus it won’t make me nauseous.) 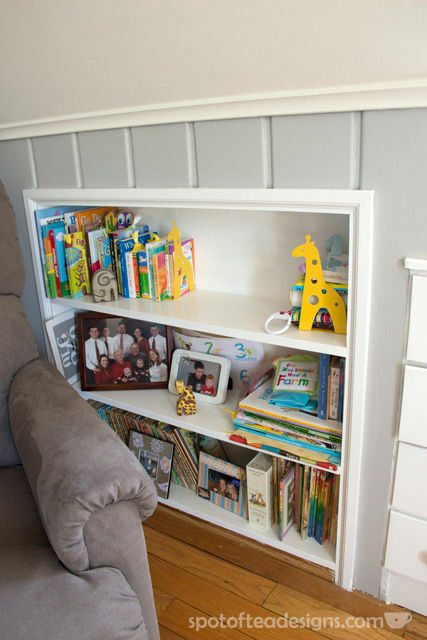 Bonus: it can be used for watching tv after its use in the nursery! I also finally had the perfect place to hang the owl painting Tara had made me years prior. She told me many times she would paint over it for me, but I knew it would find a special place in my nursery one day. Animal lamp – This lamp was given to my brother from our Aunt. It fits great with our theme.